Nawana was a turning point battle. It was here, a Bolivian Army led by German General Kundt, armed with new weapons (tanks, flame-throwers, fighter-bombers) assaulted the Paraguayan defenses not from Paraguay's capitol. 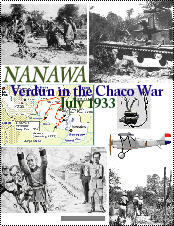 Kundt had been led to believe the defenses were weak, that the tanks would break through and that once Nanawa fell, the road would be open to Paraguay’s capital. This was in fact true, however, that was the only thing which was true. However, the Paraguayan forces had been issued special antitank ammo and built well defended trenches with mines. Their lines were not weak and numerically almost as strong as the Bolivian! The Paraguayans had proved themselves many times during this war as a very dangerous foe even when outnumbered. After three days of fighting and a combined body count of over 4000 men with little real gain, the Bolivians halted. 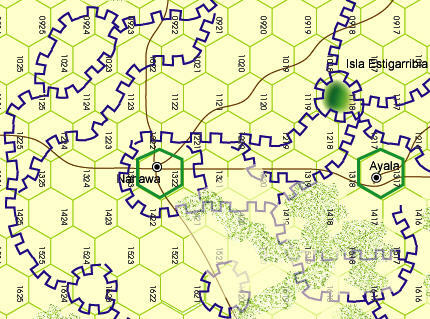 One 11x17 inch map, 280 counters, company, each hex is 250 yds., each turn is eight hour for a total of 10 turn. Playing aids include Game Turn record, numerous charts and tables. Each aircraft or tank is one of that type.